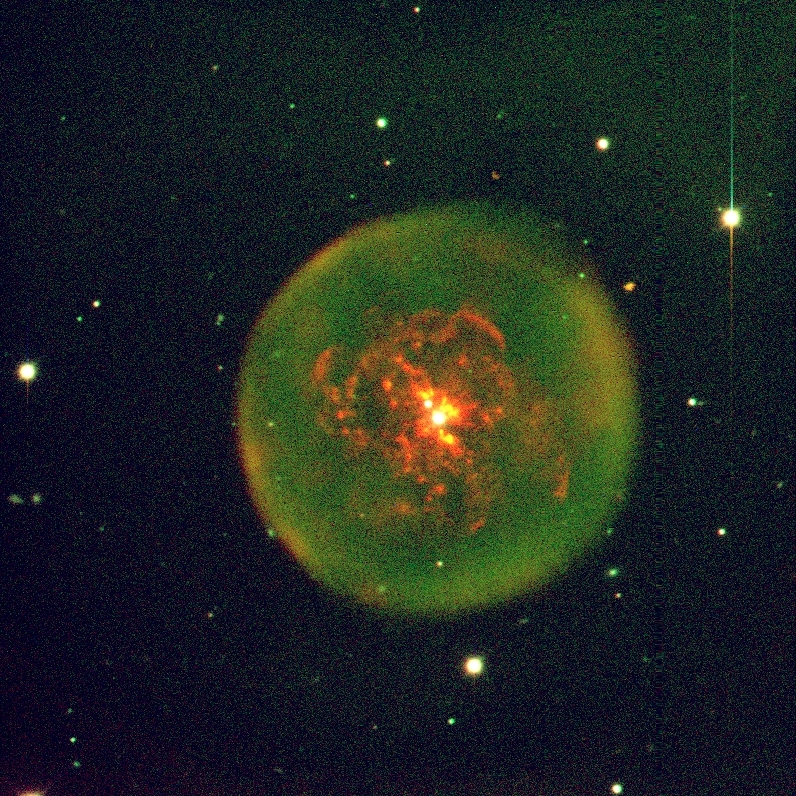 These images of the planetary nebula Abell 30 were taken with an electronic detector known as a "charge-coupled device" or CCD, at the prime focus of the 4-meter Mayall telescope at Kitt Peak National Observatory. Separate images taken through narrow-passband filters have been combined into the color images you see here. All images shown are uncopyrighted unless indicated otherwise. Click on images to see (or download) a larger, full resolution version. These are the same images as above, but displaying different colors for different filter images brings out different details in the data. Planetary nebulae are created at the end stages of evolution of many low and intermediate mass stars. The expanding nebula is really the outer layers of the "old star". 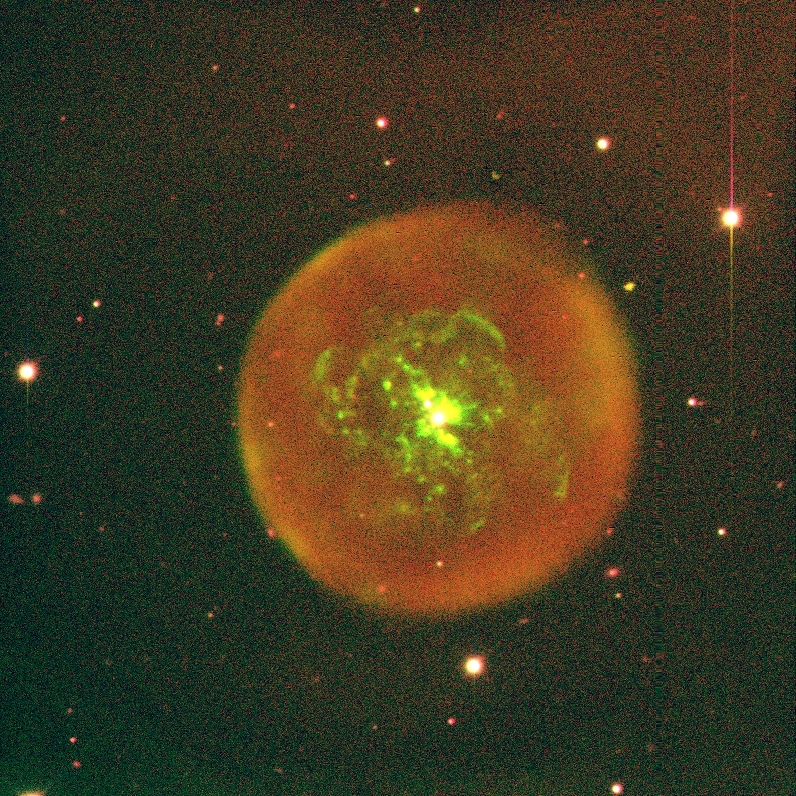 Although Abell 30 has a very uniform "bubble" on the outside, the interior region shows a lot of structure, seen here especially well in the "oxygen-III" image. In this image, we have caught Abell 30 "in the act" of actually shedding the star's oxygen-rich gas mantle. Eventually only the tiny core of the original star will be left behind as a white dwarf star. Return to Bill Blair's home page.